"I'm a guy that decided to marry a woman -- a black woman -- that wasn't perfect, that had flaws, that through all in all, she's been successful on her own. ... and that's a bad thing. I decided to marry this woman, then I decide to be a father to my child," he says with a laugh. "And that's a bad thing. It's not like I got caught with a gram of coke in my car or speeding or was caught for murder, so why would I be ridiculed, that's why I don't understand -- that's the part that is mind boggling. Why would I be ridiculed for that, even a year later." --Usher- on being ridiculed for loving his wife. CNN.com/Entertainment. 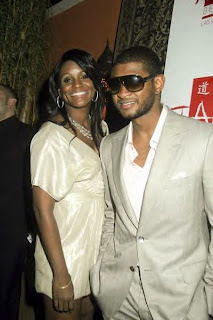 Tiffany: (I don't understand either) Kudos to Usher and Tameka for fighting for their love. Ooo wee, I pray for these two. I am a cheerleader for commitment and marriage, major positive energy toward the two of them. Again, Usher, thanks for showing your love for the woman-YOU selected to spend your life with.